Frightened, anxious, hyperactive and stressed dogs can be calmed quickly using this easy to give liquid. Dropped into the mouth, given on food or even just a few drops sprinkled on a pet’s bedding can result in a more amenable pet, so visits to the vet, travelling, fireworks or moving house instantly become less stressful situations. 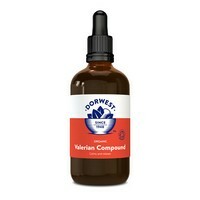 How Much Valerian Compound Do I Need to Give? Organically grown fresh herb extracts of Vervain 50%, Valerian root 25%, Mistletoe 25% extracted from organic plant material conforming to British Herbal Pharmacopœial specifications.